Taking photos of other people's art is generally not good photographic practice. But what about when art melds with the human form? For this week's Shooting Challenge, you're going to photograph a tattoo. Take a photograph in which a tattoo is the focus. Most tattoo photography is pretty horrible. Some dude has shaved his leg and used too much flash, so you get this unappetizing blown out calf meat, no matter how great the original tattoo was. It doesn't have to be this way. The easiest trick to tattoo photography is simply to go outside or near a window—in morning or late afternoon, or just find a spot with nice diffused light. This sidesteps the flash problems if you don't have a nice lighting kit for indirect light. Make sure the tattoo is well-moisturized (this thread recommends oil...though you'll want to wipe that away) so the colors pop. And while you're free to take a tattoo macro, consider the tattoo and the form of the body in one—or put differently, consider it a tattoo'd person's portrait rather than a tattoo portrait. 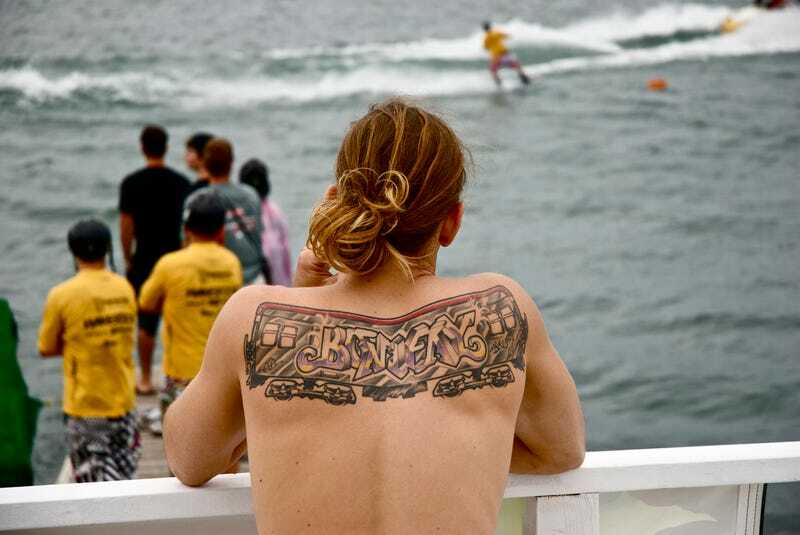 Then sharpen or boost contrast/color in post production, but also consider doing this selectively in the tattoo area. Our lead shot is from flickr's chris_hau. What I like about it is that the tattoo lives in a scene. It has context, and it's not artificially carved out from the human form. That said, I'm excited to see all of you top it. Send your best photo by Tuesday, September 3rd at 10AM Eastern to contests@gizmodo.com with "Tattoo" in the subject line. Save your files as JPGs, and use a FirstnameLastnameTattoo.jpg (970px wide) and FirstnameLastnameTattooWallpaper.jpg (2560px wide) naming conventions. Include your shooting summary (camera, lens, ISO, etc) in the body of the email along with a story of the shot in a few sentences. And don't skip this story part because it's often the most enjoyable part for us all beyond the shot itself!